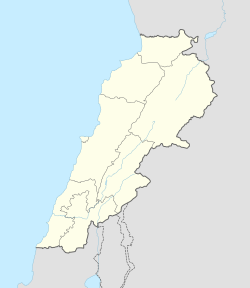 Enfeh(Arabic: انفه), or Enfe, Anfeh, Anfe, is a town in the Koura district of the North Governorate of Lebanon at Latitude 34°21'0"N and Longitude 35°44'0"E. Enfeh borders the towns of Chekka, Al-Qalamoun, Barghoun and Zakroun. It is located 65 Kilometers north of Beirut and 15 Kilometers south of Tripoli. Its total area is 4.93 square kilometers, and its population is around 6,500. The people are primarily Greek Orthodox and Maronite Christians, with a minority of Sunni Muslim. Today's village of Enfeh is built around the ruins of several short-lived cities going back to the pre-Phoenician period. Natural dwelling caves abound on the surrounding hill of Al-Gheer; the original city lies on a small near-island about half a kilometer into the sea. Its outstanding feature is that it is the only town throughout the eastern coast of the Mediterranean to be carved out of its rocky surroundings. Some of the carvings go all the way back to the Phoenician period, and possibly earlier, as witness to the fact that the name of Enfeh appears in the Tell-Amarna tablets of ancient Egypt; (see letter no. 2 by Yapa-Hadda). which were sent by the governors of the coastal Canaanite cities to the Pharaohs of Egypt asking for help in repelling Amorites intruders (nomad tribes originating from the middle Euphrates region in the North). Letters written by Rib Addi, the King of Byblos, specifically mention the Canaanite city of Enfeh (called “Ampi” in the letters) and state that Enfeh, after being occupied by the Amorites, fought with the Amorites against Byblos. Enfeh was conquered by the Assyrian army in the 7th century B.C., when it was known as "Anpa". The remains of subsequent settlements include dwelling caves, places of worship, cisterns, water tanks and wine presses, as well as steps and roads all carved in the rock. One ancient quarry, known as the Great Trench, was used by the Phoenicians as a dry dock; The Phoenicians used the place as a shipyard for the construction of their vessels, as it was a strategic point on the mediterranean coast. The Enfeh peninsula was once a mighty fortress area, the Crusader castle of Nephin (Enfeh), fief of the Counts of Tripoli. The Crusader Lords of Nephin, triply safe behind the walls of Enfeh, the vast rock-cut moat which severed the peninsula from the town, and the sea-swept battlements of their citadel, soon established a reputation as robber barons, the terror of travellers between Jerusalem and Tripoli. The town itself had a better reputation, for its wines were known and prized far and wide throughout the Latin kingdom in the 12th and 13th Centuries. Enfeh entered its glory days during the Medieval era, and most of the archaeological and historical monuments that can be seen today date from this period. Around the 13th century, Enfeh was a small, fortified village surrounded by fertile fields, and it was famous for its wine production. It was one of the lordships of the county of Tripoli, governed by French provincial nobles from the Renoir family. The French Lord was eventually chased out of Enfeh by the Prince Bohemond IV of Antioch, the Lord of Beirut, and the Genoese, and he took refuge in Cyprus. Enfeh, as a cell or a hive sculptured out of the ground, is surrounded by walls and fortifications of enormous stones hauled from the nearby quarries. In 1282, Enfeh was part of one of the greatest plots that marked the end of the Crusades. The Lord of Byblos, the Genoese, and the Knights of the Temple (a secret brotherhood established during the Crusades) rose up against the Count of Tripoli Bohemond VII, but they were brutally crushed. Bohemond VII punished the Genoese by blinding them, and he buried alive the Lord of Byblos and his family in the Fort of Enfeh. In 1289 Sultan Qalawun suddenly attacked, captured and destroyed Tripoli. The knights who escaped from the burning city to the two remaining coastal castles of Batroun and Nephin (Enfeh) were unable to withstand the full fury of the Mamluk army and beat a further retreat to the island kingdom of Cyprus. Sultan Qalawun destroyed both castles so thoroughly that even the site of Batroun's citadel is lost from history. With Nephin (Enfeh) it was a different story, for here the Crusaders had performed one of the great engineering feats of the Middle Ages. They had cut off the peninsular fortress from Enfeh proper by cutting a great moat, at sea level, all the way across the peninsula, for over 100 yards, through the living rock, leaving only a small spur in the center at the south end to support the castle's drawbridge. Saydet El-Rih in Arabic, the oldest church of Enfeh, was built in the Byzantine era. It is believed that sailors and fishermen from the village of Enfeh built the chapel so that the Virgin Mary would protect them as they sailed the Mediterranean. It has a vaulted nave that ends with an apse oriented toward the east. On the west side, the nave is preceded by a square vaulted room that corresponds today to the entrance of the church. This room was once part of a rectangular hall, which was part of a nursing home that used to be connected to the church. Even though the roof of the chapel has long collapsed, it still retains traces of remaining frescos that are difficult to see. The old frescos depict Saints George and Demitrios, the baptism of the Christ, and the Christ in His Glory with some of the evangelists. The frescos on the south wall represent the Virgin Mary calming a storm. The Monastery of the Watchman, dating from the Crusades period, is attached to Balamand, the monastery of the Greek Orthodox patriarchate. Deir el-Natour has an attractive interior cloister and the church has recently been decorated with paintings and frescos executed in Byzantine style by artists from Odessa. Famous Lebanese diva Fayrouz chose Deir el-Natour in 2010, to perform her yearly chants of the holy Friday, in the scenery of its beautiful chapel and mediterranean landscape. Built during the Crusades, it is Lebanon's only remaining Romanesque church. The Church of Saint Catherine was originally dedicated to the Holy Sepulcher. The dedication was later changed to Saint Catherine during the 17th century, when the church was restored by local inhabitants. The church is built of sandstone. It has a rectangular vaulted nave with an apse at its east end. There are two main doors, one to the west and the other to the north. A small, vaulted chamber built in the southwest corner of the church can be accessed from the inside of the nave. Another room was built over this chamber and used to be accessed by a swinging ladder. On top of these rooms was the original bell tower. The new bell tower was built in the mid-20th century in a different architectural style. There is also a funerary cave near the church of Saint Catherine, which was transformed into an oratory. It was decorated with a circle inscribed with two Greek letters (Alpha and Omega) representing the Christ. Built next to the Church of Saint Catherine, this 18th-century church was dedicated to both Saint Simeon and the Archangel Gabriel. Architectural elements typical of the 18th century can be observed in the structure, such as the jars embedded in the ceiling to reduce noise and echo inside the church. It is the biggest and main church of the town. Its dome adds a form to the skyline of Enfeh. Mar Youhanna al-Ma'madan in Arabic, is an ancient monastery surrounded by green landscapes and some curious rock cuttings. the site host the saint john festivals every summer. Enfeh has a Mediterranean climate characterized by four notably different seasons with a moderate nice weather during spring time. Summers are mainly hot, while winters are cold and rainy. The table below displays average monthly climate indicators in Enfeh based on 8 years of historical weather readings. Its population is estimated to be around 6,500, not including the thousands of emigrant families and young individuals. One of the many Lebanese villages where the number of inhabitants is a speck compared to the number of villagers abroad. Global emigration occurred as far back as the mid 19th century with records showing young men and families migrating to the new world mainly Australia and the Americas (North and South). The emigration continues till the present day. Some families are extinct and others are greatly reduced in number. However, in the diaspora, if you visit any major city or town specially in Brazil, Argentina, Qatar, Australia, Canada or the USA you will almost certainly find someone whose ancestors come from this village. During holidays specially summer many of the empty houses are joyfully cleaned and return to life with visiting families. Enfeh is primarily Antiochian Orthodox, and there are several historical churches and local shrines throughout the village. Farid Makari: Lebanese politician since 1980, He was elected as a member of the Lebanese Parliament in 1992 and reelected in 1996, 2000, 2005 and 2009, he served as information minister in Hariri’s second cabinet from 25 May 1995 to 7 November 1996, Former Vice-President of Lebanese Parliament since 2005. Wide areas of Enfeh and its surrounding are covered by salines. Along the length of the bay, the salt marshes add a typically pretty note to the landscape, especially with the traditional wind wheel which pumps seawater. The production of sea salt is a staple of the local economy. "White gold", as it is called, provides for an inexhaustible natural resource which can thus be extracted without endangering the environment. Around 415 inhabitants practice fishing on a regular basis. The 80 full-time fishermen own their boats and maintain them. Fishing is the livelihood and main source of income for many families in Enfeh. Fishing boats have sought shelter in the natural harbor of Nhayreh in bad weather conditions. The large terraces on Enfeh's rocky coast shelter underwater species feeding on the seaweed and attract large numbers of fish. That place also attracts many anglers willing to fill their baskets with different types of fish. Fishing, by itself, is an art in Enfeh, inherited by its ancestors. Fruits consist mainly of: Olive trees producing quality table olives and olive oil, and Grapes (seedless and non seedless). Enfeh attracts a lot of tourists, especially during summer time, for its beautiful picturesque landscape of small white houses, windmills and salines on its rocky beaches along the Mediterranean coast. its historical monuments, old churches, and archaeological site of its peninsula make it one of the top touristic destinations of the Lebanese northern coast. Enfeh is very well equipped to receive tourists, offering them a wide choice of activities and touristic resorts such as Marina Del Sol and Las Salinas. Tourists can also enjoy fresh fish by the sea at local restaurants that offer fresh daily picks. Enfeh is equipped with one public school (Gebran Makari School). Private schools are available in the surrounding region of el-Koura, and in the nearby city of Tripoli. The three top universities of northern Lebanon, are around 5 to 10 minutes by car, like balamand university, usek in Chekka, and USJ in Al-Qalamoun. Lying between the natural harbor of Nhayreh and the archaeological peninsula, the Enfeh creek consists of an attractive rocky shore shaped as a perfect semi-circle at whose bottom lie many sandy underwater caves. It has become a haven for hikers and swimmers who are drawn to its well-preserved view and always clear water. Many swimmers enjoy the wavy clear sea of Enfeh, others prefer the olympic swimming pools that are available for practicing outdoor in summer and indoor in winter. During the war, Lebanese national swimming championships were mostly held in Las Salinas and marina del sol in Enfeh. Enfeh is known for its clear water, one of the cleanest waters on the Lebanese coast, home to a wide variety of fish. the archaeological peninsula hides many secrets in its bottoms below sea level, attracting curious divers. The waves of Enfeh's sea are not big enough for surfing, and its rocky shore doesn't help much. although its mostly windy weather during summer, makes it a top destination for wind surfing. equipment rental are available in town. Recently the wind of Enfeh is attracting the new small kite surfing community of Lebanon, a sport that is gaining fast popularity in the region. Enfeh's mediterranenan landscape has attracted the cameras of various film directors. The town has been the set of several local movies. Cinema is very popular in Enfeh. The town has the number one cinema theatres in the north, Grand cinemas las salinas. Easily accessible from the main Beirut-Tripoli highway, taking the Enfeh exit. It is also reachable by taking the Chekka exit and heading north, or the Balamand exit and heading south. The roads are satisfactory and well maintained by the municipality. The road through town is the old main road that connects Beirut to Tripoli, now called the seaside road, parallel to the old train railway. The ancient archaeological site was put in danger by a proposed expansion to the adjacent port that would have compromised its historical integrity. Even after the project was sidelined, development pressures from nearby communities continue to threaten the long-term preservation of the site. ^ "Enfeh's climate equated with Tripoli's climate due to close proximity". climate-zone.com/. 2006. Retrieved 2010-01-12. This page was last edited on 11 March 2019, at 16:45 (UTC).